My husband and I recently added up our student loan and credit card debt, and we were shocked at the figure–$58,000! What was this debt comprised of? It is made up of nearly $38,000 in student loans, $6,500 on a business credit card for a business that failed and $13,500 of personal credit card debt spread over two cards (the smallest balance at $1,000), largely due to our current low income and some not so wise purchases. At the urging of everyone around us, we began to follow Dave Ramsey. Because we do not yet own a house but would like to in the next 3 to 5 years, we decided to become Gazelle Intense, as Dave Ramsey says. 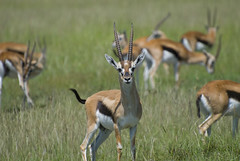 What does gazelle intense look like for us? My husband is gone to work and away from the house for 10 hours a day. After spending an hour with the kids when he comes home, he works on his dissertation and articles for publication for a few hours a night. I stay home with the kids all day and blog, do virtual assistant work and freelance writing when the kids are napping and after they go to bed. On the weekend, I typically leave the house for about 4 hours on both Saturday and Sunday to get more freelance work done. I estimate that I am working 25 hours a week from home, and my husband is putting in another 20 hours a week at home doing work that will further his career and hopefully lead to a high paying, tenure track job in a few years. Our hard work is paying off. In just two weeks, we “found” an additional $701 to apply to our debt beyond our regular debt repayment schedule, and we just paid off our first credit card with the lowest balance. We plan to pay off the credit card with $6,500 within the next 4 weeks. As anyone who has become Gazelle Intense knows, there is a period of adjustment when getting used to the austere lifestyle that is required. Let’s be honest—most people who have credit card debt have at least some of it because of a lack of impulse control and planning. Was all of our credit card debt due to that? No, we had a very low income for awhile, and we relied on credit to make ends meet. However, we also ate out more than we needed to. (Do you ever need to eat out?) Our debt now is higher than it might have been had we been more stringent with ourselves and our finances. Because there is such an adjustment, to maintain your gazelle intensity and avoid frugal fatigue, consider rewarding yourself for each debt that you pay off or at a milestone you set. If you have one large debt to pay off, maybe you will reward yourself for every $5,000 you pay off. For us, since we love to eat out and now no longer eat out at all, we have decided that we will have one meal out every time we pay off a debt. To maintain your drive, pick one thing you used to enjoy spending money on in your old, less frugal lifestyle, and commit to enjoying that activity once when you achieve your assigned goal in your debt snowball. Keep it reasonable, less than $50, so you don’t derail your snowball, but give yourself that leeway to maintain your intensity. Being gazelle intense definitely has rewards—put yourself in a painful place for an intense while until the debt is paid off, then, begin to reap the rewards of all your hard work by living like no one else, as Dave Ramsey says. Yet, be careful not to become so strict with yourself that you give in to frugal fatigue and derail your debt snowball. A small, planned out treat is often all it takes to keep you motivated and ultimately debt free. Keeping managable goals that you can make along the way is a big key here. One other thing I found is to make sure that you look at progress over the long term. You might one day find that $2,000 per month (just throwing that out there) doesn’t give you the same kick, but if you look at a six month history, you’ll definitely get juiced about having paid of $12,000 or whatever number it actually is. It’s really all about perspective! I think this is a terrific strategy for paying off debt. I’m working on paying off my car and am thisclose. It’s such a great feeling. Next on my agenda are my student loans. Come the first of the year I’m making a plan and sticking to it. Thanks for the motivation, Melissa! Getting gazelle intense takes some getting used to, but once you’re in it it is very easy. I was on gazelle intensity for about 18 months before expenses started piling up. Watch out, because it’s just as easy to fall out of – good luck! My wife and I can only get into this type of groove every once in a while. We did it for our wedding, we are doing it for our debt pay off before we attempt to have our child. It definitely is something you can only do for brief spurts. Good luck in paying down your debt. I sometimes wonder why my Mum bothers to save all the drink cans, magazines and the newspapers just to resell them. It’s not like me and my siblings don’t give any money to her to spend. She doesn’t seem to owe anyone money or even addicted to shopping and spending money. After being laid off by my company last year, I began to understand the need of live frugal life even when we are not lack of anything at the moment. Nobody can predict the future. I now love to learn how to live frugally from the websites online and then write them down on my own website. That’s how the search engine brought me to your website. Thank you for sharing all of these valuable tips and thoughts. I will keep an eye on your website updates in future for more tips and information. Keep it up! One of the things we did when we were going through that process is I just kept a very simple little spreadsheet where I listed our debts and then each month I just recorded the current remaining balance. That spreadsheet ended up being a big encouragement for me. Inevitably, you are going to get discouraged along the way and wonder if you are even making progress. The problem is we forget where we started from. When those times occurred I looked back at that spreadsheet and I could go back 6 months or a year and I realized just how much progress we had made. We paid off about $43,000 in a little over 2 and a half years. Wasn’t always easy but we did it. The Dave Ramsey stuff really does work. We did it. I’ve led 8 FPU classes now and I’ve seen it work time and again in others.